Learn how to grow grapes at home for an easy and useful crop! Growing organic grapes at home is surprisingly easy - and fun. A grape crop growing in the apple tree with the apples - not so easy to reach! It is seems, on the face of it to be a daunting task. After all, viticulture is a highly specialised form of agriculture - and one could easily take a lifetime to become an expert grower of fine grapes. But many people could benefit from growing organic grapes somewhere in the garden. The vines look splendid and there's a bountiful crop in autumn to benefit humans and wild birds alike. If I had not been growing organic grapes myself for several years now, I would not credit how easy it is to get a worthwhile crop! We get dozens and dozens of bunches of grapes over about a four week period every autumn. We don't always use them all - so the birds benefit, too. Hornets and other insects seem to enjoy the habitat which to my mind, enriches the garden environment. Hornets, despite their size and fearsome looks, are not really dangerous. To understand best how to grow grapes, you need to know a little about your soil and climate. It is important to select a suitable grape variety for your soil and climate. There are now varieties available which do quite well in relatively cool areas where the summer sun rarely delivers reliable heat for weeks on end. Here in the UK many people are growing vines where previously they were perhaps not worth the trouble. There are now many successful wine producers, too. This partly owing to our changing climate. The best advice for selecting a good grape variety for your garden - is to take advice from local horticulturists. The better garden centres will often provide expert advice for free. After all, they stand to make a sale. To be sure of good advice, it is perhaps worth asking several people from different establishments. It's also worth looking in the catalogues for available types. The main distinction is between grapes grown for eating and those grown for wine. There are many available which will satisfy both needs. We chose a good all-rounder which also looks attractive in autumn - a Concord grape. Concord grapes are suitable for juice - most of America's grape juice comes from Concord grapes - and they do OK for other purposes, too. They are high in potassium and there is even research to suggest that they offer protection against breast cancer! We now have two vines which both do pretty well. The only down side I've noticed is that the pips are rather large. This isn't too big a problem as they are relatively few in number. Once you have decided on the best variety for your needs and soil type, buy a healthy-looking plant from a reputable outlet. The best time to establish a new plant is during damp but mild autumn weather. Dig as large a hole as you can to more than accommodate the root system of the vine. As with most plants, you need to dig a hole which is big enough for the roots and more. Give at least 50% more space than the bare roots appear to need and you should be OK. Dig down even further and wider and incorporate lots of well-rotted manure and leaf litter for a fast start. Vines are natural forest inhabitants. They like a cool, damp root area but plenty of sun for their upper leaves. Leaf litter from oak or ash trees is good. Place the roots in the soil so that the stem of the vine starts at around ground level - or slightly below. If the roots have been cramped in the pot, tease them out gently so that they occupy more space. Add a post or some kind of support to get your vine started. Backfill the soil and compost and firm everything down around the roots. Water copiously for the first few days to help the roots to become established. Tie the stem to the support. You will probably want to train your vine, rather than let it grow haphazardly wherever it wants. For the first few years, trim off side shoots and tie the main stems to supports so that you can begin to shape the vine in the way that you want it to grow. A new vine will fruit within a year or two. These fruits are best left. Once the vine is bearing a good amount of fruit you can begin to use it. Early fruits will be small and often uneven. Some people may want to trim out a proportion of the fruit. This is likely to lead to the rest of the fruit being bigger and more developed. I can't say that I've tried this to any extent. Our vines produce lavish amounts of small but sweet fruit and we have trouble using even a small proportion. Maybe next year I'll try this approach. So far, I've opted for a straightforward, low-labour way of working my vines. They have been encouraged to grow up fence posts and a nearby apple tree. So far this has worked quite well. The apple tree produces its normal, heavy crop and there is a fairly huge grape crop which ripens at about the same time. You should supply your vine with plenty of organic matter. A liquid feed will help get a newly-established vine off to a fast start. Now my vines are reasonably mature they get whatever the rest of the garden gets - seaweed plant food such as Maxicrop, compost from the compost pile and some spent mushroom compost or 6X manure. Make sure that the area around the base of the vine is not overgrown and add mulches and composts once or twice a season. Fruit can be slow to ripen if your summers are cool. It can help to trim away some of the leaves near the fruit bunches so that more light is admitted. Keep checking sweetness levels in the fruit. Once the birds are starting to make merry you can be fairly sure that a lot of the fruit is ripe. 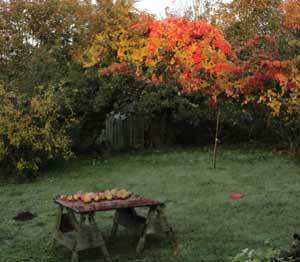 Pick the fruit before the weather gets seriously cold or damp as rot will start to set in quite quickly. 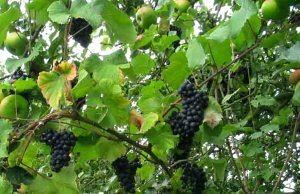 Home-grown grapes can be pleasant to eat raw - even in chilly, damp Britain, they can become sweet enough if the weather is kind in September and October. As global warming kicks in, more and more people are taking advantage of the improved growing conditions for grapes. There are several commercial wine growers near us now. Making your own wine is another option. A home juice extractor, though not ideal, will save you from having to plunge your bare feet into a bucket of soggy grapes! Filter the juice, add some sugar if needed and a good wine yeast. After the first rush of fermentation, put the juice into a demi-john and fit an air-lock. Make your own grape juice by cleaning and boiling the grapes and then filtering them through a drip bag. This avoids having to crush them and produces a very usable result. Add a little sugar if desired. This juice is also useful for cooking, much as you would use wine.